Chocolate-Covered Strawberry Brownies make by far the BEST strawberry and chocolate combination. 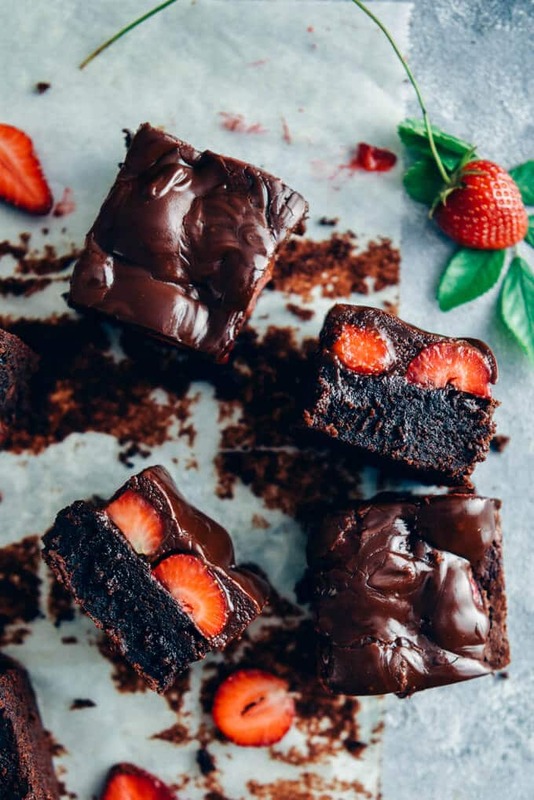 Fudgy and moist chocolate brownies topped with fresh strawberries and covered with a rich chocolate ganache will sure knock your socks off. My favorite ingredient in baking is chocolate. I feel like a pro whenever I bake something with chocolate. Probably brownies are on top of the list because it’s easy to make and you can easily impress someone with them. That being said, I know your favorite chocolate recipe on Give Recipe is Chocolate Strawberry Cake. This is probably because of the perfect marriage of strawberry and chocolate in that cake, which has led me to think of this strawberry brownies recipe. Who wouldn’t be impressed by strawberries? There is no fruit that is more attractive than strawberries. What is your favorite way of eating them? Although I love them fresh and as they are, I can never resist a chocolate strawberry combination or when they are topped on a lighter dessert like our Strawberry Cream Cheese Pie. I’ve been planning to make chocolate-covered strawberry brownies since I discovered my passion about combining these super pretty looking berries with chocolate when I first made Chocolate-Dipped Strawberries. These two can make any occasion so pleasing. Can you imagine how these strawberry brownies will become an awe-inspiring dessert for everyone you serve them to? I love brownies. I adore strawberries covered with chocolate. Most of you do too. So how about combining these in one recipe that is sure to please everyone? There is no doubt, this is a decadent dessert. You will feel it once you have the first bite. If a slice of fudgy brownie with chunks of fresh strawberries covered with a silky layer of chocolate can not take you to heaven, I don’t know what can. Let’s face it, this is not one of those healthier desserts but it’s okay to spoil yourself once in a blue moon, right? On the other hand, if you are looking for less guilty brownies, go check our Healthier Avocado Brownies recipe. It is incredibly tasty as well. I make the brownies from scratch but you can use your favorite brownie mix. If you want to add even more chocolate in your brownies, add in some chocolate chips in the batter before pouring it in the pan. I think the amount of chocolate is enough when you consider the chocolate ganache on the top. Bake the brownie of your choice. See ours below in the recipe section. Let it cool down completely. Slice the strawberries in two and place the sliced parts down on your newly baked and cooled brownie. Meanwhile prepare the chocolate ganache. Let it cool a bit and pour over the strawberries. Chill in the refrigerator for half an hour or until set. I think you can use this method with any fruit you like. I’m planning to try it with peaches when they are in season. Will definitely let you know. What other fruit would you like to see on such fudgy brownies with a rich chocolate sauce? Your ideas are always welcomed! Please share them in the comments section. Do you like combining brownies with fruit as much as I do? If yes, you need to go check out our Orange Chocolate Brownies and Liz’s fantastic Cherry Chocolate Brownies too. If you are not in the mood for brownies, yet still looking for a good dessert bursting with berries, Tricia’s gorgeous Blueberry Breakfast Cake is the right option for you. 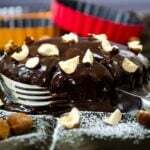 If you make this recipe and like it, please leave a rating below in the comment section and share it with your friends! Butter a 8X8 inch square pan, line it with baking paper and put aside. Melt butter in a saucepan. Remove from the heat and add in chocolate chips when it’s still hot. Mix until smooth. Add in sugar and mix. Add in eggs, one at a time and mix well. Pour the chocolate mixture into the bowl. Mix until combined. Sift in flour and salt. Using a spatula, stir until combined. Pour the batter into the prepared pan and bake for 30-35 minutes. Let it cool completely. When it cools completely, slice the strawberries in halves and place them on top of the brownie. Put the sliced parts down on the brownie. Heat heavy cream in a bowl over simmering water, add in chocolate chips and let it melt. Whisk it occasionally until smooth. Bring it to room temperature. Pour it over strawberries. Let it cool in the refrigerator for about 30 minutes or until the ganache is set. These were fabulous! I used a boxed brownie mix because I didn’t have a lot of time but they were still amazing. I took them to my Bible study for our snack today as I thought they would be a perfect Valentine’s Day treat. Everyone raved about them! I’ll definitely be making these again! The only change was that my ganache did not make enough to cover the strawberries, so I ended up doubling it. I’m so happy to hear that Katie! Using brownie mix makes the things way easier. Thanks for sharing your feedback! Thanks Fatima! I use plain flour for this recipe. Hi Molly! I’m sorry the recipe didn’t work for you. What was the exact problem? Was it too gooey or dry? I’d love to help. Such a wonderful, beautiful, drool-worthy dessert! I love the combination of strawberry and chocolate. Sharing and pinning! Thank you so much Tricia! It’s very kind of you! These are simply stunning! My Goodness!!!!! Wow! Thank you for these kind words my friend! Perfect timing as the strawberries in our markets are looking great! What beautiful brownies! Thank you Liz! Glad you love them. I can add strawberries in anything these days.